GrandCentral, GoogleVoice and their new best friend, Ooma – MacCog. grease your digital wheels. UPDATE: Google is accepting (and granting) invite applications as we speak… so if you’re interested at all, click on this link to sign up to receive an invitation. Google’s as yet-unreleased “GoogleVoice” service isn’t so new. I’ve been using it’s predecessor, GrandCentral as my primary business and personal phone number for 2 years. This is a retrospective on the service and a review of the significant new features. Feel free to ask questions in the comment section and to retweet the post so more can discover this revolutionary new service. I learned about Grand Central from David Pogue’s first column about it. It was still in invite-beta so I had to scrounge an invite and quickly fell in love. The amount of groundbreaking features it had was astounding… and on April 16th, 2007 I integrated it into my business and began to give it out as my only phone number… just like they suggested. A few times since then I’ve doubted the wisdom of my early adoption tendencies, especially when it comes to basic business functions like phones. I’ve had many problems with Grand Central over the last few years including some chronic ones recently that were so frustrating for my clients that I’m afraid I might have lost some phone calls and therefore some business from it. Several people (though not all) reported that when trying to leave a message a lady’s voice cut in and asked “Are you still there?” even though they were clearly talking. It would force them to stop mid-message and either re-record or start over after pressing 4. Most people left annoyed messages at that point and suggested I fix my “machine”. Well, my machine wasn’t fixable because as soon as Google bought Grand Central they stopped taking suggestions or feedback and removed any sort of support options from the site… and it was free so could I complain about? I began to worry and look into other options. Google seemed to be dropping the product, a victim of its financial belt tightening. I even went to the Google booth at Macworld and asked for someone working on Grand Central… but I’d apparently just missed them. They’d been there the day before! I did talk to a guy who was sympathetic and assured me that the 2 founders worked across the hall from him and that they were hard at work at… something. So, because nothing offered the power and simplicity of Grand Central, I continued my heavy use of the service in spite of the uncertainty and problems. Well, on March 12th, I awoke to a happy surprise… Grand Central had been upgraded to Google Voice and was sporting all the old features and some crucial new ones. I immediately transferred over my account and began testing the new Google interface and features. Since I use my GrandCentral, er… Google Voice number for everyone, friends and family and business alike, I’ve tried out every feature they have and can answer questions on Twitter or in the comments section about them… but I’m going to focus on the features that have been the most interesting and/or useful for me. First, the new SMS feature is awesome. I’m realizing now how many texts I must have missed when GrandCentral didn’t support SMS because people thought they had my cell number. Oh well. Now if someone texts my GV number, I get a text from a strange number and it says their full name at the beginning of it. There seems to be one number for each person (so I attach the number to that person for future incoming reference), though I have no idea how google could be using so many numbers for just texting. The chat thread is online next to my (transcribed) voicemails, and best of all, I can reply to a text from the browser (or iPhone) if I want, saving on SMS charges. The next great addition is transcription. Google has integrated their Goog-411 technology to my voicemails, and I love it. I can’t say that the transcriptions are very accurate yet. I hope they improve a lot and quickly… but I can get the gist of a voicemail through a variety of means without having to listen to it. Via email or SMS: GrandCentral could always send you an email or SMS when you’ve received a message, but now it’s more than a link to the website. They don’t yet include an mp3 or wav file as an attachment like Vonage or Ooma, but the transcription therein more than makes up for it. Via google.com/voice: This is of course the most full featured option. From here I can do all kinds of fun things like review the transcript and tell Google how mildly useful it is, listen to it, download the mp3 version for posterity, add a note for my assistant, email or embed the message, or even call back the person with whichever phone I choose. The email similarities continue, though: I can delete the message, report it as spam, flag (or “star”) it, etc. Never again do I have to delete that awesome drunk message from my friend or the important stuff from my clients. Now I’ll have a searchable archive for voicemail just like email! With my iPhone. Hallelujah, I can finally check my voicemail without dialing into the service like an old school VM system. Call me spoiled, but once I had Visual Voicemail on the iPhone, it seemed rather quaint and stupid to be forced to dial my own number and listen to messages one by one to get to the one I wanted, just like the old days. That was necessary because Grand Central’s website was flash, their mobile site used some encoding method that wouldn’t work with the iPhone, and they hadn’t bothered to create an app! Well, Google still hasn’t created an app (see wishlist below) but the Google Voice mobile site will thankfully play my messages via the web. The last dynamite new addition is the Google Contact integration. One of my biggest problems with Grand Central was the fact that its address list, which allowed me to keep track of who has called me and what numbers they call from, was a one-way street. I could import my contacts from Apple’s Address Book once but it became a different universe. For someone who prides himself in his clean Address Book, this was tough. Now, Google has a contact API and promising integration tools with my Macintosh Address Book that will complete this loop. iPhone app – this is a no brainer and I imagine only a matter of time before it comes out (official public release date maybe?) but it’s a barrier to usage right now. The excellent mobile site still doesn’t do everything that an app could and should do… like using the built in iPhone Address Book and outgoing GV caller ID… like adding outgoing messages… like making the voicemail experience and UI as good or better than what the iPhone has built in! At least they could give the mobile site an icon… this icon is all I see. The next step for SMS would be for google to integrate this into Google Chat somehow…. finally making SMS and IM seamless and cost effective! It would bring the multi-input power of something like Twitter to private text messaging too! Send an IM to a friend who is offline and get the option of sending it as an SMS to his grand central number instead. 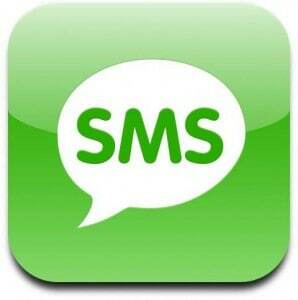 Receive SMS messages in your IM client and respond as normal… the possibilities are exciting. And now… the marriage of two services that would flip my lid: Ooma meets Google Voice! If you’ve never heard of it, Ooma is a Vonage-like voice-over-internet (VOIP) service that is revolutionizing home phones. Instead of a monthly service like Vonage that’s only marginally cheaper than traditional land lines, Ooma eliminates the monthly phone bill entirely! Yes, that’s right… you get unlimited calling, cheap international rates, good voice quality, online voicemails delivered to your email and available on the web and more… for free! I’ve been using Ooma for a few months now and have already recommended it to some friends and family. The biggest downside of GV is that when you call someone normally from your phone, they will see your home or cell phone as the caller ID… not your GV number. If you’re truly trying to have one number to rule your life, this is a problem. You can place every call from the GV website, but that becomes too cumbersome and when you don’t do it, inevitably someone calls you back on your home number or direct cell number. With Ooma, you should be able to have your GV number show up on Caller ID instead. In fact, I was excited to learn yesterday that the Ooma blog already has responded to this idea and promised to offer a GV plug-in! Good job, guys! (It requires the $99/year Ooma Premium, but that’s worth it to me). In its efforts to piggyback on Google Voice, ooma has been well served by its own long reliance on technology from Grand Central, a service Google acquired in July 2007 and the driving force behind Google Voice. “A number of our engineers have been using Grand Central for over a year as part of our own beta test, so when Google finally released its information on Google Voice, we could see there some of the things we had already been doing with its precursor, Grand Central,” Buchanan said. I want any messages left on my home or business lines (both of which are currently managed by Ooma) to be instead in my Google Voice box and basically do away with Ooma’s voicemail system entirely. If these new features work out as well as they seem like they’re going to, I will have reached phone-management nirvana… and for almost no money! Thank you, Internet!